Hereford and Worcester Moths: Hartlebury again. 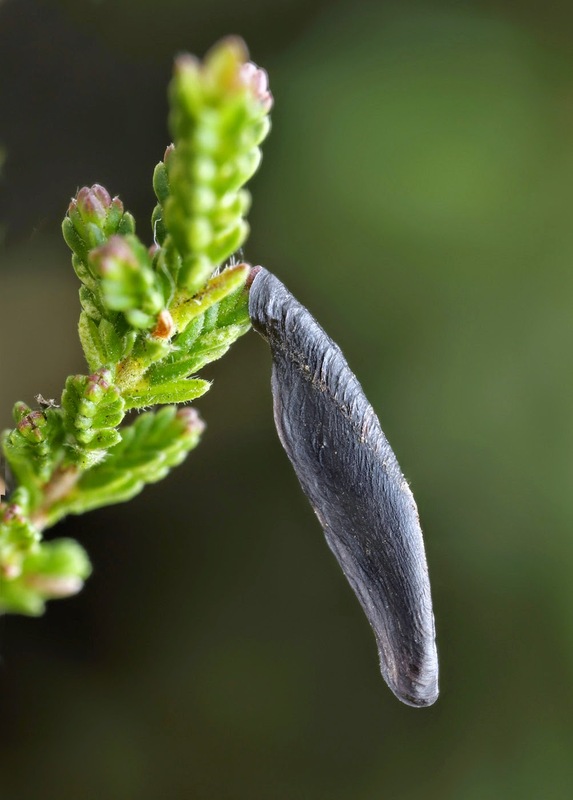 Following Oliver's very useful post about his visit to Hartlebury, yesterday, I spent an hour there myself, sweeping the heather for Coleophora juncicolella and C. pyrrhulipennella larvae. In no time at all I had my first C. pyrrhulipennella in the net, easily seen against the bits of heather. I transferred the netted debris into a container to be checked later for C. juncicolella and continued for a further 45 minutes, recording eight C. pyrrhulipennella in that time. Returning home I studied the debris from the net and eventually spotted one C. juncicolella moving about. This morning I was surprised to see only one further larva had climbed up the side of the container and it was not until lunchtime it was joined by a further ten individuals, showing just how patient you need to be with this species (at least, that was the case in this instance). While on the common I also saw Common Heath, Cydia succedana and Small Yellow Underwing. There is a definite pattern to this. Pyrrhulipennella is, of course, more visible than the incredible camouflage of juncicolella; but juncicolella seems much slower to move and it is worth keeping the gleanings for at least 24 hours. I've recently caught both of them in this way, in Surrey and in Sussex. (Only pyrrhulipennella in Bucks). Thanks Andy, same in Hampshire. I have just returned from the New Forest where, during my stay, I spent half an hour sweeping the heather, recording 2 pyrrhulipennella and 7 juncicolella, the latter only revealing themselves over the following 24 hours.